Are you one week out from the Visual Arts exam and not sure where to start? No worries, we’ve got you covered! In this 7 day Visual Arts Study Plan! We’ve split up your study into four 30-minute blocks to make your study time manageable and enjoyable. If you follow this step-by-step study guide you will feel confident and prepared for your HSC or trials exams! Start a fresh notebook: For me, there is nothing better than the feeling of a fresh notebook. I personally enjoy using non-lined art diaries for note-taking, but think about what sort of notebook suits you best. Choose some music: This is art! So get your creative juices flowing and listen to some instrumental music while you make summaries. Click here for one of Spotify’s great study playlists. Buy some highlighters: Highlighting key words and details is going to be super helpful in this study tutorial, so get your hands on some highlighters. 9 different colours is best, but you can make do with at least 4. Click here for “Practice” syllabus notes. Summarise the above information into three separate mind maps, based on each heading. 7 points coming out of each of each mind map should be sufficient. Each mind map should take you about 5 minutes to complete. Tip: Many people don’t like mind maps -if that’s you, feel free to write these notes out under headings. The conceptual practice of an artist refers to their ideas, their philosophies and the thoughts an artist tries to provoke. Material practice refers to the specific materials an artist has used, their methods and techniques and the technical details of an artwork. 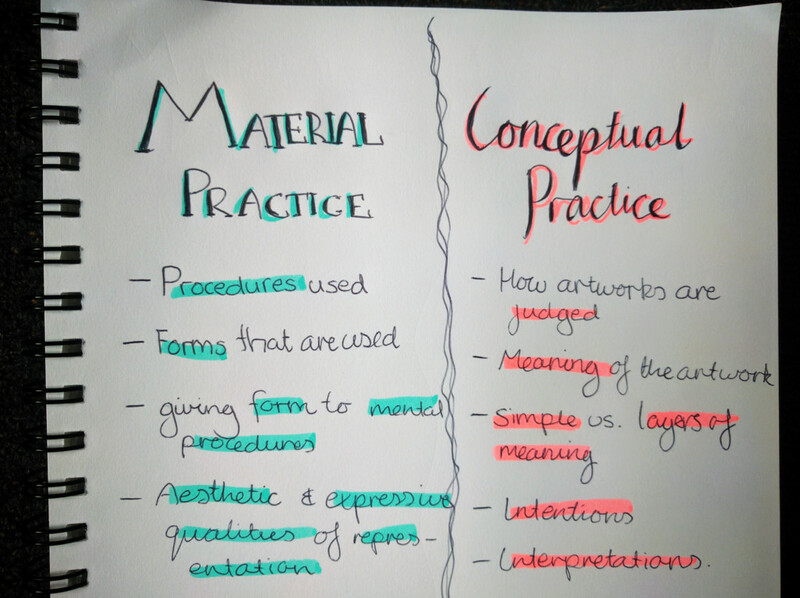 Start a new page and make two headings: conceptual practice and material practice. Beneath each heading write out in dot points the things that make up material and conceptual practice. You’ve finished your first block! Take a break, eat some food, go for a swim, have an adventure, wrestle some crocodiles! Come back feeling well rested for your next block. Click here on information to summarise for the Conceptual Framework. 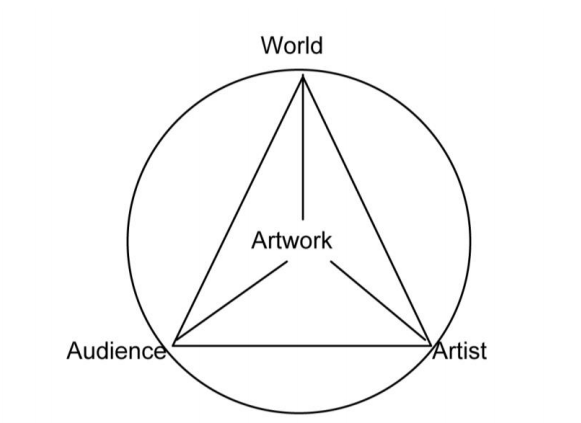 The conceptual framework is broken up into Artist, Artwork, World and Audience, as seen in the below diagram. 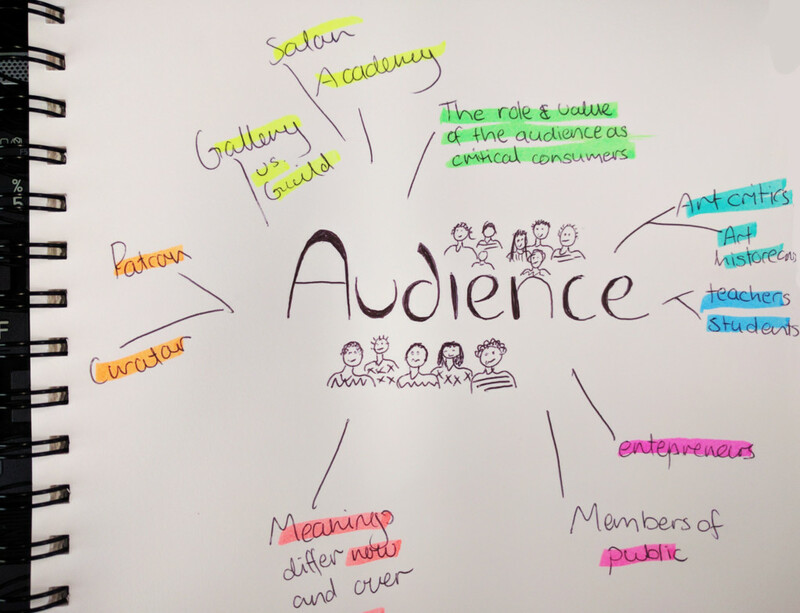 Under each heading (Artist, Artwork, World Audience) write 3 points, using the key words highlighted in your mindmaps. Colour code your mind maps! I like to use orange for Structural, green for cultural, yellow for subjective and pink for postmodern. But colour code them any way you like! Beneath each heading (Structural Frame and Cultural Frame) write 3-5 dot points regarding how Turrell relates to the Structural and Cultural frames. Colour code your mind maps! I like to use orange for Structural, green for cultural, yellow for subjective and pink for postmodern. But colour code them any way you like. And you’re finished! Well done on completing day 1 of your Visual Arts Study plan. Choose two artists you have studied at school to complete this part of the tutorial. Note: you may already have thorough artist’s notes from class. If so, you can copy and paste sections of these notes to put them into these categories. Write 3 SEE points below each heading (Statement, Example, Explain). Look below for example. Use the key words highlighted in yesterday’s mind maps to guide you. For each heading write 3-4 SEE points. Create the headings – Subjective Frame and Postmodern Frame. For Subjective Frame make sure you include quotes from the artist/audience depicting how the artwork made them feel. You’re half way through your Visual Arts study plan now! Well done, and keep going! With Art Essays, rather than memorising an essay word for word, it’s best to memorise your TEE points and then apply it to an essay scaffold. This gives you the best opportunity to be well prepared for your exam, while being flexible so you are able to best answer the question. Day 4 of the Visual Arts Study plan will walk you through this. Read this article for a scaffold for a HSC Visual Arts essay. After you have read it, download the template found at the bottom of the article. Feel free to include an artist’s or art critic quote. Consider practice, conceptual framework and the frames as this is what questions will be based on. Use buzz words. Have words in your thesis which are obscure or interesting, to introduce your key concepts. You will be able to repeat these words throughout your essay to say to your marker, “Hey look, I’m linking back to my thesis.” e.g. philosophical, psychological, mythological, fantasy and imagination. Say something interesting. This is the first sentence your marker is going to read, you want to immediately give them a good impression and make your essay stand out from the rest. Explain how contemporary art has shaped our understanding of the different roles of artists. ‘The making of art is an intuitive act rather than a planned process.’ Evaluate this statement. Use the article to guide your responses. Insert the SEEs you came up with yesterday into the “analysis” part of the paragraph. Using the image at the bottom of the article, create a response using the steps listed in the article. use the question: How does the material practice of Gogh reflect his thoughts and ideas? Now that you understand what it takes to write a band 6 response, we’re going to go through exactly how to scaffold your answer per mark you receive for it. Read the band 5/6 responses available on the board of studies website. Think about how the scaffold is used in these responses. Think about ways you could improve these responses. 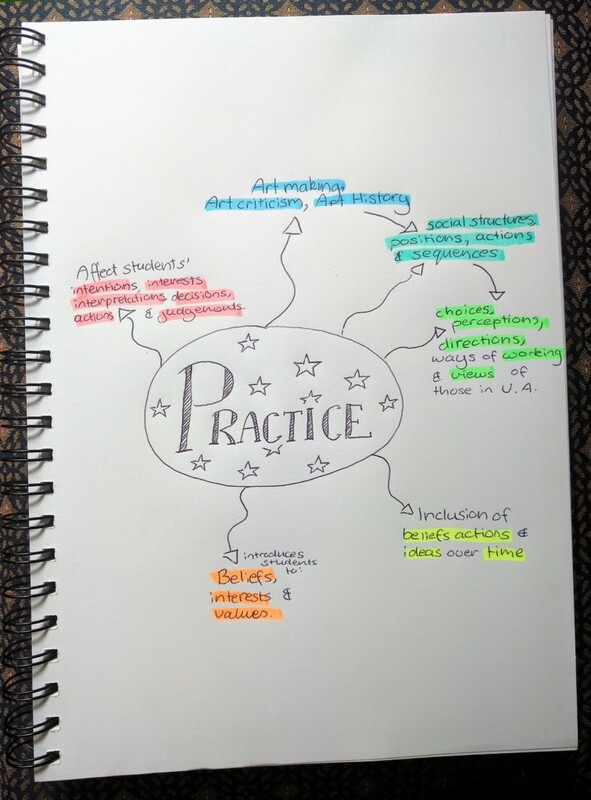 Open practice paper – Answer Questions 1 and 2 to practise your section 1 writing skills and scaffold. Note: You will have more time now than you will in the exam to complete this section. In the exam you will only have 45 minutes for he first 3 questions. Open this practice paper – Answer Question 3 to practise your section 1 writing skills and scaffold. You’ve finished all the theory of the Visual Arts study plan! 2 days left and just practice exams to go! Find a place and time period where you won’t be disturbed. Use the timer on your phone so you know how much time you have left. Make sure your phone is on aeroplane mode. You don’t want to be interrupted! Use lined paper and a pen that allows yo to write quickly. Papermate inkjoy pens are an HSC go to. Click Here and Click Here for the marking guidelines, exemplar answers and Marker’s notes. Write an evaluation of your exam and give yourself a mark for each section. Click Here and use the links under answer for a compilation of previous years to mark your paper.